Alaska's Trans-Alaska Pipeline Transformed The State's Economy Oil began flowing down the trans-Alaska pipeline in 1977, transforming Alaska into a wealthy state. 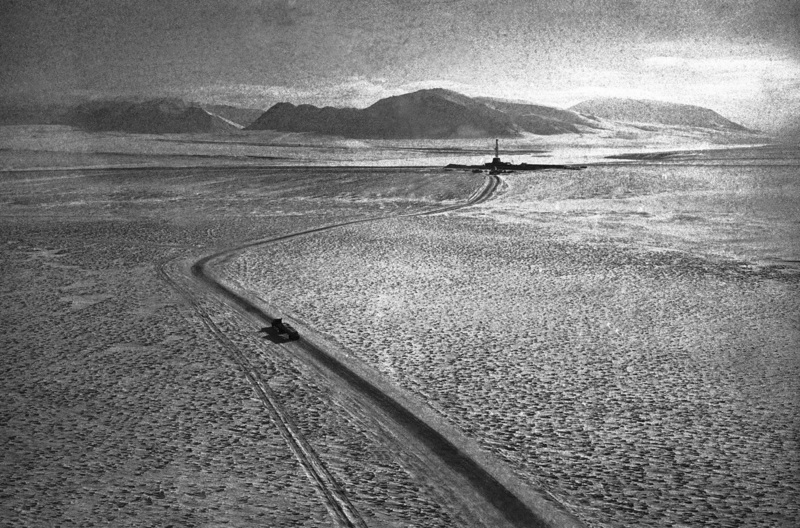 But if it wasn't for one man, the Prudhoe Bay oil field may not have never been found. An oil derrick stands out on the bitter, icebound terrain near Prudhoe Bay, Alaska, in 1974. In late May on the floor of a drilling rig on Alaska's northernmost edge, oil workers were dwarfed by giant pieces of machinery. They were slowly pushing pipe thousands of feet below the tundra to tap one of the biggest oil fields in North America: Prudhoe Bay. The oil field started production 40 years ago this month. Twelve billion barrels of oil later, it has completely reshaped Alaska's economy. Between 1980 and 2016, oil revenues paid for the vast majority of Alaska's government services. Now, Alaska's long dependence on oil may be coming to an end. This story was produced in partnership with Alaska's Energy Desk, a public media collaboration focused on energy and the environment, as part of a new podcast, Midnight Oil. The eight-episode podcast explores the trans-Alaska pipeline's 40-year history, how the pipeline reshaped Alaska's economy and asks if Alaska will always be an oil state. "You have a state where oil had paid for almost everything and suddenly the oil revenue – most of it — has evaporated," said economist Gunnar Knapp, former director of Institute of Social and Economic Research at University of Alaska Anchorage. After four decades of production, it's getting harder to pump oil out of Prudhoe Bay. The field has been in steady decline since the mid-1990s. The amount of oil flowing through the 800-mile trans-Alaska pipeline each day is now about a quarter of what it carried at its peak in the 1980s. That, coupled with a crash in oil prices, means the state faces an uncertain future. Today, Alaska state lawmakers are battling over what to do next, and narrowly averted a government shutdown this month. But the discovery of the giant oil field that started it all almost didn't happen. You could argue — and a lot of people do — that Prudhoe Bay's billions of barrels of oil might still be hidden under the tundra today if it weren't for Tom Marshall, who's now 91 years old, and lives in a little brown house in Anchorage. Tom Marshall, a petroleum geologist, suggested that the state select Prudhoe Bay. It reminded him of big oil basins he'd seen in Wyoming. Marshall won't bring it up himself, but for many Alaskans, he's a hero. There's an award tucked between the photos lining his living room wall. It's for "professional discernment and courageous foresight." Marshall earned this award for something he did in the early 1960s, when he worked for the brand new state of Alaska. Then, the state depended largely on federal dollars and a few resource industries, like salmon fishing. Marshall remembers it as a tense time — with a tiny economy and population, it was a real question whether Alaska could support itself. "There was a great deal of anxiety of just how we were going to accomplish this," said Marshall. But under the statehood act, Congress handed Alaska something like a scratch off lottery ticket. While the federal government still controlled much of the Alaska's 375 million acres, the state could select over 100 million acres to develop as it pleased. If Alaska picked land with valuable resources, it would have a winning ticket. "This land would put us in a position to pay our bills," said Marshall. 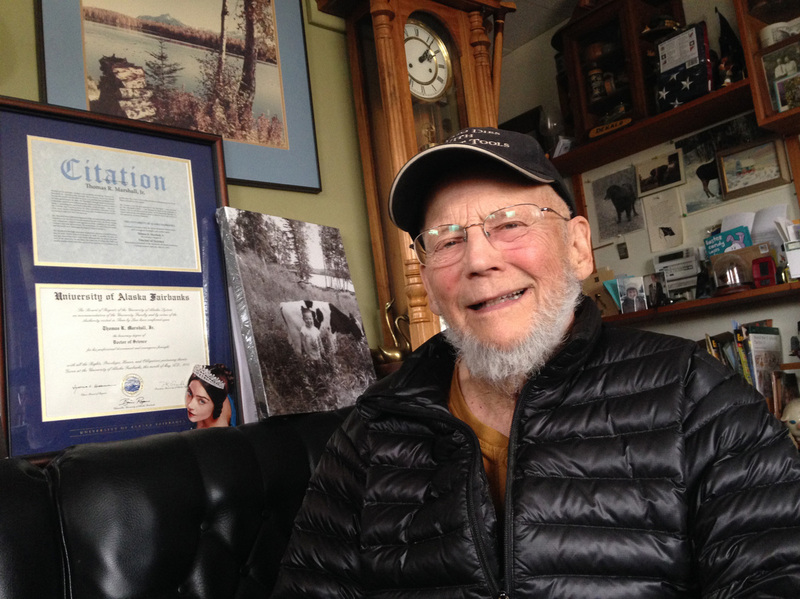 That's when Marshall, a petroleum geologist, quietly became Alaska's most important employee. He was tasked with picking the land. A ragged chunk of Arctic coast called Prudhoe Bay caught his eye. The geology reminded Marshall of big oil basins he'd seen in Wyoming. Marshall thought this could be the jackpot Alaska needed. But when he suggested selecting a remote chunk of tundra on the icy ocean, Alaska's first governor, Bill Egan, wasn't impressed. "Gov. Egan's comment was, 'doesn't he know it's frozen?'" said Marshall. Still, Marshall kept pressing Egan to select Prudhoe Bay. Some people thought Marshall was onto something. A handful of oil companies were intrigued with Alaska's northernmost edge, a region known as the North Slope. This vast, remote area stretches from the Brooks Mountain Range north to the Arctic Ocean, and includes Prudhoe Bay. The federal government had started leasing land on the North Slope in 1958, and a few gutsy companies were laying plans to drill there. It took years and a combination of pressure from the oil companies, Marshall and others, but Egan finally relented and selected Prudhoe Bay for the state in 1964. "They wrote 'Marshall's Folly' on there," Marshall said. Harry Jamison worked for one of the oil companies taking a risk on the North Slope. Like Marshall, Jamison hoped there might be a billion-barrel oil field hiding there. It would take that much to justify the astronomical cost of transporting the oil from the Arctic to market. Jamison knew it would be a challenge. "Billion-barrel oil fields don't come along every day. There have been very, very few ever discovered in the United States," Jamison said. And soon, dreams of a billion-barrel oil field in Alaska's Arctic started seeming like a long shot. Starting in 1963, BP and Sinclair Oil Corp. teamed up and drilled six wells on federal land near the Brooks Range. All six were dry. After that, a series of other companies came up short, too. Eventually that included Jamison's company, ARCO. The oil companies that had taken a risk on Alaska's North Slope started hemorrhaging money. "It was extremely discouraging," Jamison said. "The whole industry was really down on the North Slope by that time." After well after well came up dry, Marshall's Prudhoe Bay selection started to seem like a mistake. By 1967, Jamison said most oil companies had given up. But then, ARCO and Humble Oil teamed up and moved the only drill rig left on the North Slope to Prudhoe Bay. It was the oil industry's last shot. On a flight to check out the Prudhoe Bay well just before Christmas 1967, Jamison remembers looking out the window of the plane. "You don't see anything. I mean, it's absolutely black," Jamison said. "And it's not just remote and dark and cold, but it's downright dangerous." 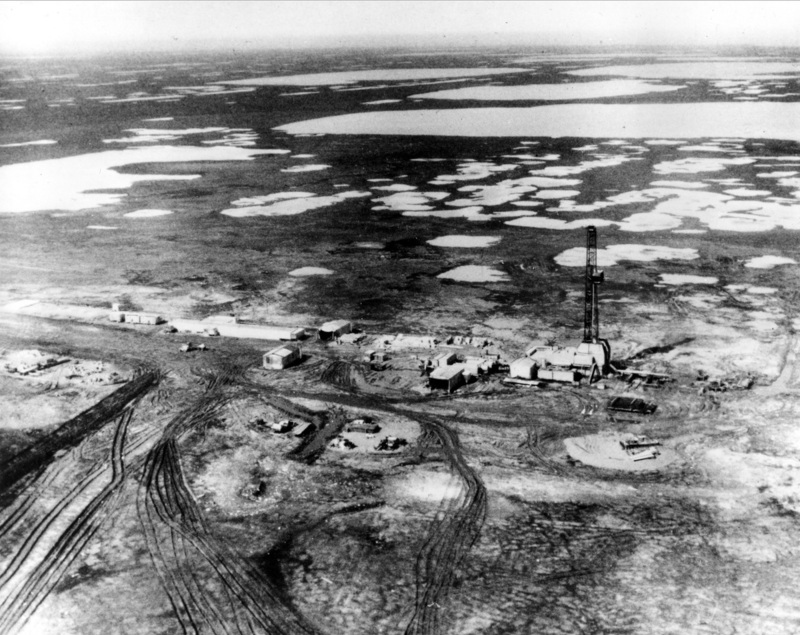 One of the first oil wells of vast petroleum deposits discovered in Prudhoe Bay, in 1968. Far in the distance, Jamison spied a single light. It was the lonely rig: Prudhoe Bay State Well No. 1. Gil Mull, a young geologist working at the well at the time, said for weeks, drilling the well wasn't all that exciting. "Almost like watching grass grow," he said. Then one day, they tested the well's pressure. When the crew opened the valve, Mull said there was a powerful burst of gas. "It sounded like a jet plane overhead. It's shaking the rig. It's a rumble. It's a roar," he said. The crews ignited the gas rushing from the pipe. It sparked a 50-foot flare that burned in the darkness of the North Slope sky for more than eight hours. A few months later, the companies drilled a second well to confirm the size of the oil field and discovered it was huge. Initial estimates were that Prudhoe Bay held 9.6 billion barrels of oil – at the time, it was the biggest oil discovery in North America. It's still the biggest ever found in the U.S.
"Ponder for a moment the promise, the dream ..."
Prudhoe Bay's discovery was a watershed moment for Alaska. It led to the state's highest highs and lowest lows. It provided the state with so much excess money that to this day, every Alaskan gets a check for more than $1,000 each year. And in 1989, the Exxon Valdez oil tanker ran aground in Prince William Sound, spilling close to 11 million gallons of Prudhoe Bay oil — one of the worst environmental disasters in U.S. history. But it would be years before all this would happen. When Prudhoe Bay's discovery was announced, all Alaska's leaders knew was that the state would never be the same. "Alaska has become established as America's greatest oil province," Egan said in a 1970 speech. "Ponder for a moment the promise, the dream, and the touch of destiny." Finding Prudhoe Bay came down to a few things going exactly right. If the companies hadn't decided to drill that one last well, if they hadn't found enough oil, and if Marshall hadn't pushed the governor to select the land in the first place, there's no question the state would be very different. Marshall's not one to brag about his contribution, though. He said he was just doing his job. But that's not to say Marshall doesn't get any satisfaction out of it. Asked if it still bothers him that so many people doubted him for so long, Marshall burst out laughing. "Oh, not at all, because they were so wrong!" said Marshall. "I mean, let's face it — Prudhoe Bay oil field was the largest oil field ever discovered on the North American continent. Why should I feel bad about that?" Elizabeth Harball reports for Alaska Public Media. This story is part of a new podcast, Midnight Oil, produced by Alaska's Energy Desk, a public media collaboration focused on energy and the environment. A previous version of the digital story incorrectly noted the amount of oil spilled into Price William Sound in the 1989 wreck of the Exxon Valdez oil tanker. It was 11 million gallons spilled.